We ended the previous post with mentioning that Earth is not the only planet with a magnetic field. 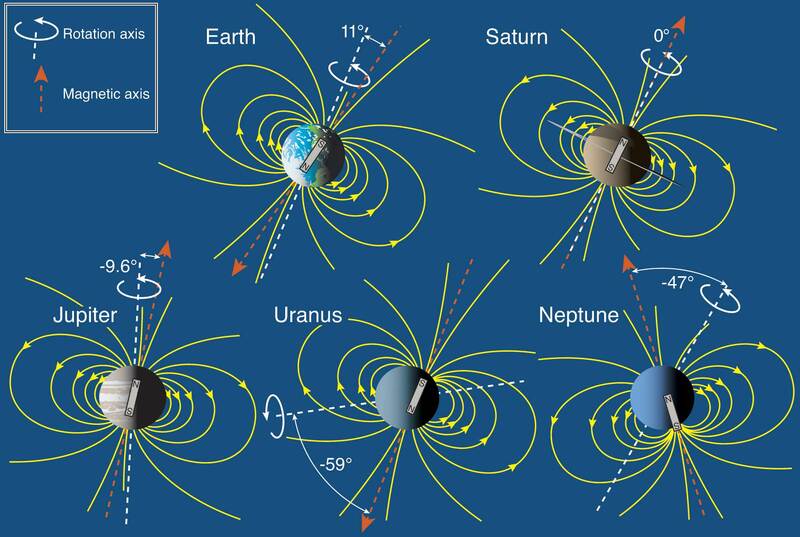 All the planets, with the exception of Venus and Mars, produce magnetic fields. Mercury, the closest planet to the sun, and one of the smallest planets in the solar system, has a magnetic field. It is thought that Mercury’s large core is doing the geodynamo process to produce the magnetic field, however, it has not been confirmed yet, and there are other ideas floating around. Mercury’s magnetic fields are only 1% the strength of the Earth’s, however, it is strong enough to repel solar flares. Currently, the MESSENGER probe orbiting mercury is working to learn more about Mercury’s magnetic field using a variety of instruments. Of the inner planets, Venus and Mars are the only planets that do not produce magnetic fields. Mercury’s magnetic fields with MESSENGER’s orbit. Venus is similar to Earth in some ways; however, it doesn’t produce a magnetic field. While our knowledge of Venus is incomplete, there are a few conjectures as to why that is. The first one is that the core has solidified and there is no convective outer core to convect any conductive fluids, and thus no magnetic field could be produced. Another conjecture is that, since the planet went through a major resurfacing event, the crust has effectively sealed the core in, and the core became heated to a uniform temperature which doesn’t promote convection. Another theory is that in addition to the lack of convection, Venus is also rotating so slowly (243 days/Venus Day)- it isn’t moving fast enough to produce any magnetic fields. Since Venus doesn’t have a magnetic field, and any solar flare will interact with the ionosphere directly, the ionosphere will slow the flare down and redirect the flow of charged particles. Since the atmosphere is dense, and Venus’ winds are intense, the ionosphere will prevent the charged particles from reaching its surface. Despite all we have learned about Venus, these theories are still conjecture, and it will be difficult to find answers due to Venus’ harsh conditions. We have more complete information about Mars, however. Mars is different, in many ways, from Venus and Earth, but like Venus, it doesn’t have a magnetic field. It has an ionosphere present, but the atmosphere is quite weak; therefore, the planet isn’t protected by any solar flares. Its mantle is presumed to be inactive, and its core is already small, having never accumulated enough iron, therefore convection in the core stopped and the magnetic field ceased to exist. However, there are traces of a magnetic field in Mars’ past found frozen into the rocks on Mars that are over 4 billion years old. There is a theory that Mars’ magnetic field was destroyed when a large asteroid impact interrupted the convective process of Mars, which stopped the production of the magnetic field. It is under debate, though, as some might consider that Mars’ geodynamo process ended when the core cooled enough to stop the convection process on its own. It makes sense since Mars is smaller, and lighter. It would take a shorter amount of time to cool down than Earth would. Since the magnetic field ceases to exist, the solar flares were able to strip away Mars’ outer atmosphere and kill any life on Mars. Unlike some inner planets, all the outer planets have magnetic fields. All the gas giants have magnetic fields, with Jupiter having the strongest magnetic fields of them all. The magnetic field works much like Earth’s, with the geodynamo process originating from its metallic hydrogen outer core and its fast rotation period. However, it is 100 times larger and extends 20,000 greater than Earth’s magnetic field. Some say that the tail of the magnetic field extends as far as the orbit of Saturn. It’s so big that it begins to repel a solar flare 3 million kilometres away from Jupiter. However, because of its larger distance from the sun, the intensity of the solar wind is 4% that of the Earth’s. This means, less effort is needed to repel it. Much like Earth, Jupiter has a set of radiation belts that trap any charged particles heading towards it. It is 1000 times stronger than Earth’s radiation belts. In addition, the magnetic fields also receive particles from its innermost moon, Io. The sulphur, and oxygen Io emits from its volcanoes create a ring of gas that interacts with the magnetic field and collects it, which creates a gas torus. Spacecraft visiting Jupiter will need to overcome the intense radiation present in its magnetic fields. Saturn’s magnetic field is the second largest in the whole solar system. It works a lot like Jupiter’s, but it is only half of its strength. This is because; the metallic hydrogen outer core that conducts the geodynamo process is smaller than Jupiter’s. When the magnetic fields interact with the solar flare, they interact from 20 Saturn radii away, and its tail extend much farther than that. The magnetosphere has many taurii, originating from Enceladus, and Titan. Enceladus ejects a large amount of water vapour into space. The water vapour ionizes and rotates with the magnetic field. Eventually, it escapes through the magnetotail. Titan has a large amount of Nitrogen ion plasma and is released into Saturn’s inner magnetic fields. There might be other sources inside Saturn’s rings, inner moons, or the upper atmosphere. When the solar flare hits Saturn, much like Earth, aurorae are formed on Saturn spanning the whole spectrum of light. Spacecraft visiting here have to overcome its intense radiation as well here. Uranus’ magnetic field is 0.1 times that of Saturn. Before Voyager 2 arrived there, no experiments took place there of its magnetic fields. They expected a magnetic field similar to the ones they knew, such as Earth’s. However, measurements revealed two major differences: Uranus’ magnetic fields aren’t in line with the center of the planet, and that it is tilted 59 degrees from the rotational axis. This means the magnetic field produced is asymmetric across the whole planet. One theory to suggest why it occurs is that, unlike the other planets where the magnetic fields are generated in their cores, Uranus’ magnetic fields is formed closer to the surface, such as in a water-ammonia ocean, where convective movement could take place. Since the magnetic axis is highly inclined with respect to the rotational axis, the magnetotail would be wound into a corkscrew shape. In addition, the radiation belts are mostly made of Hydrogen ions, which suggest that there are no taurii present from any of its moons. However, despite its differences, its magnetic fields are similar to Saturn’s magnetic fields. Neptune is very similar to Uranus and is the only other planet to have similar magnetic fields to Uranus. Its magnetic field is titled relative to the rotational axis by 47 degrees and offset by 0.55 Neptune Radii. Comparing it to Uranus, it is likely that there is convective flow in a shell of conductive liquids that drives the geodynamo process. When the solar wind interact with Neptune’s magnetic fields, it starts to repel it at 34.9 Neptune Radii, and the magnetotail extends at least 72 Neptune radii, and probably farther. In addition, it is found that there are aurorae on Neptune, but much weaker than those of Earth. These results were verified by Voyager 2’s visit to the two ice giants. However, one more celestial object has a magnetic field, and during an 11 year period, it produces noticeable black spots on it. Stay Tuned for the final segment. This entry was posted in Informational by Chris Joly. Bookmark the permalink. Thanks for the info. This is just what I needed! You’re Welcome! I’m glad this information was able to help you write your blog post.